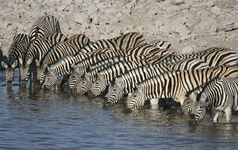 A small group, no participation lodge safari with all nights in lodges / permanent tented camps. 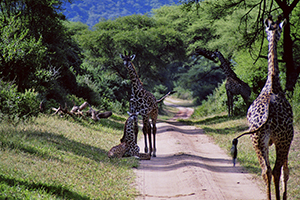 The tour starts and ends in Arusha and includes almost all of the major highlights of Tanzania and Kenya. Fully Accommodated Safari from and to Arusha. • Between May and August the migration slowly moves through the western corridor and into the Ikoma and Grumeti Wildlife Management Areas. These areas are outside of the Serengeti, but as there are no fences the wildlife can, and do, move around freely. Lake Manyara National Park, Village tour with traditional lunch, Centre for disabled kids, School visit, Masai Boma visit at Mto wa Mbu, Tarangire National Park, Ngorongoro Crater, Serengeti National Park, Lake Victoria boat excursion, Masai Mara,Karen Blixen (Out of Africa) Museum, Sheldrick Elephant Orphanage, Amboseli National Park. Breakfast and dinner will be prepared by the lodge where you are staying. They will also prepare lunch or a lunch pack depending on the itinerary for the day. Please advise us of any special dietary requirements in advance. SAFARI COST: $3,890 per person sharing. Park fees are subject to increase at any time without notice. Overnight: Moivaro Coffee Plantation Lodge or similar. Meals: Dinner At Moivaro Coffee Plantation Lodge or similar. Overnight: Rift Valley Photographic Lodge or similar. Meals: Breakfast at Moivaro Coffee Plantation Lodge or similar; Picnic lunch from Moivaro Coffee Plantation Lodge; Dinner at Rift Valley Photographic Lodge or similar. After breakfast, we set out to experience the cultural diversity of Mto-wa-Mbu, starting at the market and visiting a Chagga family producing banana beer and passing by many different farms. On the way, your guide will introduce you to the various fruits and vegetables growing in the area and explain the irrigation system that sustains local crops. After having a delicious, home-cooked meal in a local Mama’s home, we visit the nearby centre for disabled kids and school. Late afternoon we enjoy a visit to the Maasai Boma for the cultural encounter of a life time. 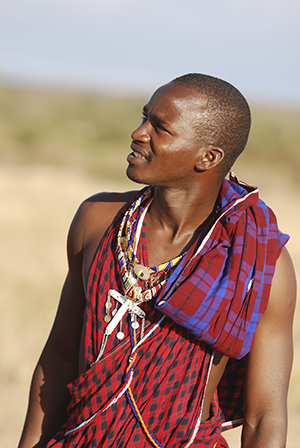 The Maasai people are semi-nomadic herders, who choose to live a traditional lifestyle and are known for their distinctive traditional attire. On completion we return to the lodge for dinner & overnight. Meals: Breakfast at Rift Valley Photographic Lodge or similar; Lunch a local Mama's house; Dinner at Rift Valley Photographic Lodge or similar. Meals: Breakfast at Rift Valley Photographic Lodge or similar; Picnic lunch from Rift Valley Photographic Lodge; Dinner at Rift Valley Photographic Lodge or similar. This morning we depart early for a game drive in the world renowned Ngorongoro Crater. For many this wildlife spectacle is the pinnacle of their safari experience. 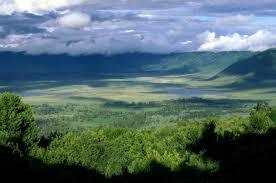 The Ngorongoro Crater boasts all of the ‘Big 5’, including a small population of endangered black rhino. After a picnic lunch, we head towards the Serengeti through the stunning Southern Plains. This is the area that the Serengeti is best known for – the endless, undulating grass savannah with rocky outcrops that serve as isolated wildlife refuges. Overnight: Kisura Kenzan Tented Camp or similar. Meals: Breakfast at Rift Valley Photographic Lodge or similar; Picnic lunch from Rift Valley Photographic Lodge; Dinner at Kisura Kenzan Tented Camp. 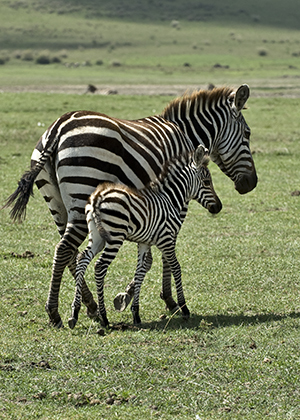 Today you will be spending a full day game driving around the Seronera area of the Serengeti. 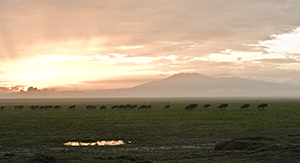 The Serengeti is divided into three main areas: The Seronera is the most central and accessible region and this is where the Park HQ is based, as well as most of the larger lodges and busier campsites. This is the part of the Serengeti that you will have seen in wildlife documentaries, characterised by the open plains of grassland, packed with animals. The Seronera River is the lifeblood of the Serengeti and this area is renowned for great game viewing all year round. 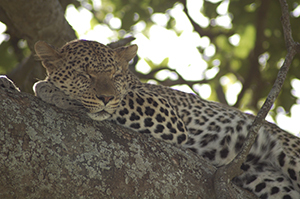 It is also particularly good for lion and cheetah sightings, as well as the most elusive of all big cats, the leopard. Meals: Breakfast at Kisura Kenzan Tented Camp; Picnic lunch from Kisura Kenzan Tented Camp; Dinner at Kisura Kenzan Tented Camp. We have another exciting day of exploring the Serengeti National Park ahead of us. With lunch boxes provided, we continue with game drives throughout the afternoon scanning the endless plains, spotting many animals and truly realizing just why this national park is so famous. In the late afternoon we drive back to the lodge for overnight. Overnight: Speke Bay Lodge or similar. Meals: Breakfast at Kisura Kenzan Tented Camp; Picnic lunch from Kisura Kenzan Tented Camp; Dinner at Speke Bay Lodge. This morning you have the opportunity to take part in a canoe paddle before we bid Lake Victoria farewell and continue our journey northwards across the border into Kenya, before heading to the Masai Mara National Park. This is the traditional land of the Masai people, nomadic herders, who choose to live a traditional lifestyle and are permitted to graze their cattle in this area. The Masai Mara covers an area that includes the river line forests along the banks of the Mara and Talek Rivers, acacia forests and the open plains of the savannah. Overnight: Mara Eden Tented Camp or similar. Meals: Breakfast at Speke Bay Lodge or similar; Picnic lunch from Speke Bay Lodge; Dinner at Mara Eden Tented Camp or similar. Meals: Breakfast at Mara Eden Tented Camp or similar; Picnic lunch from Mara Eden Tented Camp; Dinner at Mara Eden Tented Camp or similar. Overnight: Eka Hotel or similar. Meals: Breakfast at Mara Eden Tented Camp or similar; Picnic lunch from Mara Eden Tented Camp; Dinner at Eka Hotel. After breakfast we further explore Nairobi with a visit to the Karen Blixen Museum. The museum is the beautiful and historic farmhouse where Karen Blixen, author of “Out of Africa”, lived between 1917 and 1931 until she left Kenya after a series of personal tragedies. Thereafter, we head to either Giraffe Centre or Daphne Sheldrick Animal Orphanage for a visit. 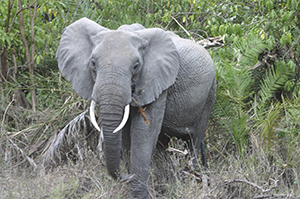 The institution is named after the wife of the late famous Naturalist, David William Sheldrick who was the founder warden of Tsavo East National Park in Kenya from its inception in 1948 to 1976. At 11:00, the baby animals are brought from the national park for a mud-bath at the orphanage, where for an hour you can get close to them and sometimes touch them. Lunch will follow before driving down to Amboseli National Reserve, arriving in the afternoon. 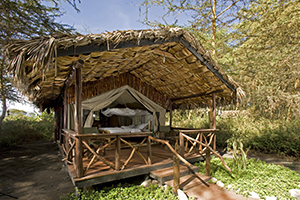 Overnight: Kibo Safari Camp or similar. Meals: Breakfast at Eka Hotel; Picnic lunch from Eka Hotel; Dinner at Kibo Safari Camp. Meals: Breakfast at Kibo Safari Camp; Picnic lunch from Kibo Safari Camp; Dinner at Kibo Safari Camp. This morning after a leisurely breakfast, we make our way to the border and then onwards to Kilimanjaro Airport. On the way, we pass the Marangu waterfalls, and then drive to KIA via Moshi town which is the gateway to the Kilimanjaro National Park. Your lodge is situated close to the Kilimanjaro International Airport for an easy connection with your outbound flight tomorrow. Overnight: Moivaro KIA Lodge or similar. Meals: Breakfast at Kibo Safari Camp; Picnic lunch from Kibo Safari Camp; Dinner at Moivaro KIA Lodge. Meals: Breakfast at Moivaro KIA Lodge. Fourteen (14) Nights Lodge / Tented Camp accommodation, all transport in a suitable 4x4 vehicle with a pop up roof for exceptional game viewing and photography, game drives as mentioned, meals and activities as mentioned in itinerary, park entrance fees (quoted separately as above), and an experienced professional guide. Travel insurance, flights and taxes, pre and post tour accommodation, optional activities, all drinks, visa fees, health requirements, telephone calls, gratuities, curios and all personal expenses. The Migration Discoverer Safari departs from the Moivaro Coffee Plantation Lodge in Arusha. When arriving in Arusha on day one, you will be picked up from the airport and transferred to your lodge. Should you arrive prior to day one, pre-tour accommodation can be arranged and you will be picked up from your hotel on the morning of day. If possible, in the evening of the first day of your safari, there will be a pre-departure meeting presented by your guide at your accommodation. It is imperative that all clients attend this meeting so as not to miss out on any critical information. We use fully equipped customized 12-seater 4x4 safari vehicles, Toyota Land Cruisers or other appropriate vehicles with comfortable seating, large windows for game viewing and a music system. The vehicles are fully air-conditioned and equipped with pop-up roofs to facilitate the best game viewing. All luggage, besides hand luggage and photo equipment, is carried on the vehicle roof rack or trailer to ensure maximum comfort in the vehicle. For this fully accommodated lodge safari, we make use of typical, mid-range African standard lodge accommodation. Accommodation is situated either in national parks, on the banks of a river, or in other places of interest. The accommodation will be a mix of lodges, chalets and tented camps, all with en-suite facilities. Some properties are equipped with swimming pools and/or bar areas. Clients are advised to bring enough money to cover the purchase of curios, tips for the guide and any additional entertainment. US Dollars, Tanzanian Shilling and Kenyan Shilling are the most practical and convenient currencies. 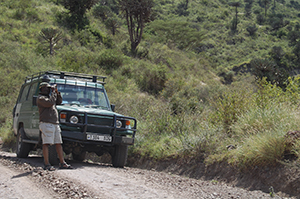 Our guides are trained in basic first aid and the vehicle is equipped with a medical aid kit. Preventative Malaria medication should be taken before the trip and throughout its duration and it is advisable to consult a doctor prior to departure. Yellow Fever vaccinations are compulsory, and your yellow fever certificate should be presented on arrival – please contact your Travel Clinic before departure. Maximum baggage allowance: 12 kg. We stipulate this luggage allowance, as an overloaded vehicle is a danger to both the clients and the guide. This does not include photographic equipment and a small daypack. Please bring soft-sided luggage (e.g. a backpack or soft barrel bag), not a suitcase. Don't bring too much clothing, as there are washing opportunities along the way. Please adhere to the allowance specified as space for luggage is limited. The Migration Discoverer is a non-participation safari. The onus is on the client to organize all visas required for a visit to Tanzania and Kenya prior to departure. A land of plains, lakes and mountains, with a narrow, low-lying coastal belt, Tanzania is East Africa's largest country and also one of its most diverse. Tanzania is home for more than 100 different ethnic groups, mostly of Bantu origin, each with its own language and customs. 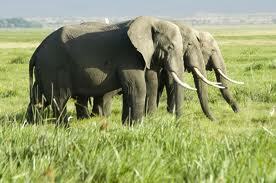 Tanzania has one of the largest and wildest animal populations in the world. Wildebeest, monkey, antelope, lion, cheetah, crocodile, gazelle, and flamingo - you name them. Blessed with some of the world's largest game reserves, the country also has one of the highest concentrations of elephant, buffalo, hippo, wild dog and chimpanzee. Its spectacular topography includes The Great Rift Valley, Mt Kilimanjaro and famous parks such as the Serengeti and the wonderful Ngorongoro Crater. Offshore are idyllic islands with beautiful palm-fringed beaches and turquoise seas that surround pristine coral reefs. The archaeological treasures of Tanzania include hominid fossils, which are more than 300 million years old. Tanzanian music and dance dominates much of East Africa. Strong in rhythm and renowned for hard-hitting lyrics, the country's Swahili-based sounds are kept very much alive by a thriving dance-band scene. Nyama choma (barbecued meat) has taken over in a big way, especially in restaurants with attached bars. But on the coast, on Zanzibar and Pemba islands, there's a decent range of traditional Swahili dishes based on seafood. 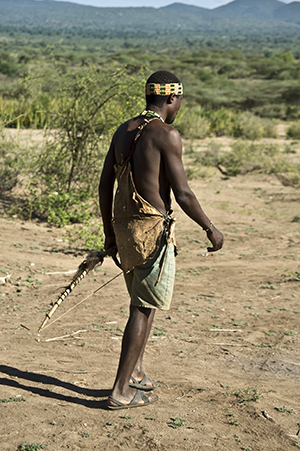 Recorded history begins around 1800, when the Masai warrior tribes were migrating from Kenya to Tanzania. It wasn't until the middle of the 18th century that Arab traders and slaves dared venture into Masai territory in the country's wild interior. European explorers began arriving in earnest in the mid-19th century, the most famous being Stanley and Livingstone. The famous phrase 'Dr Livingstone, I presume', stems from the duo's meeting at Ujiji on Lake Tanganyika. Tanganyika won independence in 1961 with Julius Nyerere as the country's first president. Nyerere, whose secret ingredient was radical socialism, gained widespread respect and is seen as one of the most influential leaders Africa has ever had. Zanzibar was stuck for another two years, after which the mainland forged a union comprising Zanzibar and the nearby island of Pemba. Thus Tanzania was born. 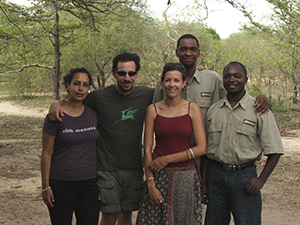 There is a wide range of optional activities to make your experience in Tanzania absolutely unforgettable. Some great views can be experienced while floating in a hot-air balloon over the Serengeti. While swimming with dolphins is all the rage on the island of Zanzibar. Snorkeling and scuba diving is equally popular due to the world-class coral reefs off nearby Pemba and Mafia islands. The Tarangire National Park covers 2,600km² and habits the highest concentration of wildlife outside the Serengeti ecosystem. Here, you can watch huge herds of wildebeest, eland, zebra, buffalo, impala, gazelle and elephant moving through the undulating countryside and taking a rest under a vast number of baobab trees, or drinking at the lagoons and the rivers. Remember not to just look on the ground though, but have a look at the branches of the trees for lion, leopard and pythons or the amazing 550 bird species also found in this area. Lake Manyara National Park sits at the base of the Great Rift Valley escarpment and is one of the most scenic parks in Tanzania. There are stunning views of the park from every direction. 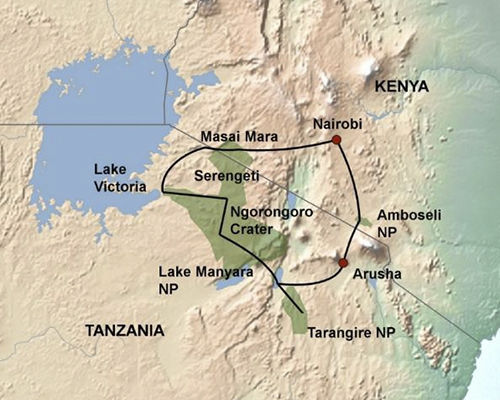 From the east, the Rift Valley escarpment emerges on the horizon with the lake forming a glistening background. On the southern side of the park, you will find the hot springs of Maji Moto, which are about 60ºC. At the top of the escarpment from the west, the park stretches across a ribbon of green with the lake shining in the sun. Like most Rift Valley lakes, the water is alkaline. This attracts vast flocks of flamingos, which form pink foam against a silver background of water. Altogether, this area offers beautiful views as you take in the massive lake with its silver shimmer and surrounding vegetation. The major landmark is the spectacular rift wall, where the plains give way to cultivated uplands of Mbululand. Measuring only 330km2 (of which the lake occupies 230km2) and located only 130km from Arusha, this park often gets day visitors, who come to enjoy the endless views and variety of mammals, reptiles and birds, as well as the varied vegetation, flora and fauna. Animals found in the area include zebra, elephant, hippo, monkey, wildebeest (gnu), waterbuck, warthog, gazelle, impala, buffalo, warthog, hyena, baboon and giraffe. Manyara is also known for its tree-climbing lions. These majestic animals find shelter fromthe heat and biting flies in the branches of trees and can easily kill buffalo, which is far greater in weight and size. There are also over 350 species of bird life, with a variety of local species inhabiting the forest and bush, including pelicans that waddle around next to short grasses on the shore of the lake. Being one of the largest calderas in the world, 20 km (12.4 miles)-wide, 600 m (1.968ft) tall, with a variety of animals and vegetation, Ngorongoro Crater is one of Tanzania's most visited areas. The vegetation includes grasslands, swamps, forests, salt-pans, as well as a freshwater lake and has been compared to Noah's Ark or the Garden of Eden. You will have no trouble finding lion, elephant, rhino, buffalo and many of the plains herbivores such as wildebeest (gnu), Thomson's gazelle, zebra and reedbuck, as well as thousands of flamingo wading in the shallows of Lake Magadi, the soda lake on the floor of the crater. Within the steep walls of the crater you will find considerable movement of animals and you may well come across local Masai tribesmen (who have grazing rights here), tending their cattle. Serengeti, which sprawls across 14.763 km2 (5.757 miles2), is Tanzania's largest and most famous national park. The chief herbivore of Serengeti is the wildebeest (gnu) of which there are up to two million. The amazing annual migration of wildebeest herds is one of the biggest attractions of the Serengeti. It begins at the Serengeti National Park near the Kenyan border, when huge herds of these animals, head for greener pastures in Kenya. Starting in April each year, they migrate across the Serengeti's southern plains accompanied by zebra, antelope, gazelle, lion and tourists! The park is also famous for its lions, which can be tracked due to the fact that many have collars fitted with transmitters, as well as cheetah and large herds of giraffe. Revered by anthropologists as the 'cradle of humanity', Kenya has the globe's most magnificent wildlife parks, unsullied beaches, thriving coral reefs, memorable mountain escarpments and ancient Swahili cities. The Swahili word safari (which literally means "journey") wouldn't mean much to most people if it wasn't for this East African adventure land, which is known for the annual mass migration of wildebeest in the Masai Mara! 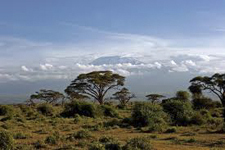 Kenya is a country in eastern Africa, bordering Ethiopia, Somalia, Sudan, Tanzania, Uganda and the Indian Ocean. 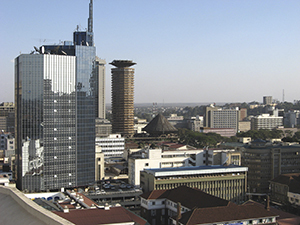 Nairobi is its capital and largest city. The history dates back many centuries from the internal diasporas, to the early settlements and migrations. After that came the formation of the various language groups who developed their own religions, traditions, governments and ruling systems, in which they dictated their way of life and how they managed to keep alive by their trade and occupations. After this the white colonials arrived. This was followed by the fight for liberation, which gave birth to the Mau Mau freedom fighters and the rise of the Kenyan heroes. Although not Kenya's largest park, the Masai Mara, as the Kenyans call it, is undoubtedly its best known and contains great concentrations of wildlife. 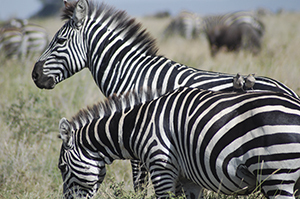 Covering an area in excess of 1.800 km2 (almost 700 miles2), it was established in 1961 and adjoins the Serengeti in Tanzania, forming the northern end of the great migration ecosystem. This is the traditional land of the Masai people, nomadic herders who choose a traditional lifestyle and who are permitted to graze their cattle in the area. 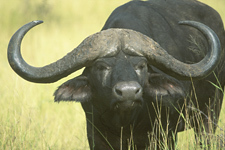 The park's habitats include the forests along the banks of the Mara and Talek Rivers, acacia forests and open savannah. These various habitats are home to a great variety of game including lion, leopard, cheetah, zebra, wildebeest (gnu), giraffe, buffalo, jackal, topi, gazelle, impala and elephant. 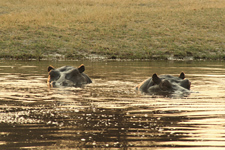 Hippopotamus and crocodile are plentiful in the rivers and the bird life is also abundant. No less than 53 different species of birds of prey alone have been recorded. You may see the annual migration as hundreds of thousands of wildebeest and zebra move through this area in search of fresh grass. The perilous crossing of the Mara River, undertaken by hordes of beasts is truly dramatic and an obvious highlight. With a perfect view of a snow-capped Mount Kilimanjaro in the distance, Amboseli National Reserve is one of the top destinations for a safari in Kenya. Although this is one of the smaller Kenyan game parks at only 390 km2, it supports a wide range of mammals (well over 50 of the larger species, and over 400 species of birds), as well as providing the best opportunity to see the critically endangered black rhino. Animals are relatively easy to see and with an estimated 650 elephants (the largest number in all Kenyan parks and reserves per km2), as well as hippopotamus in the swamps and springs, the obvious lion, leopard, cheetah, jackal, hyena, buffalo, giraffe and plains game, you are almost guaranteed a fantastic game viewing and park experience.